Any time a tuna can is opened in our house Zoe goes crazy! This is her sneaking in a couple bites! Comments for Zoe Loves tuna! 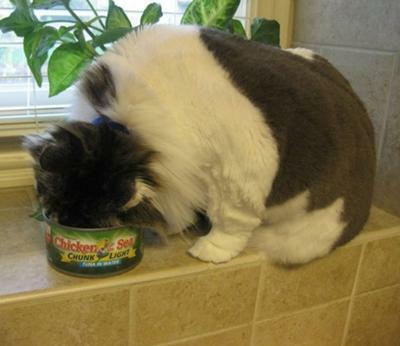 My cat loves tuna. She is an outside cat and when it is time for her to come in she comes right in and we hold the tuna can up with some in our hand. She looks up at us and we say ask nicely and she goes "Meow, Meow!" and we give her some. She is my little princess and with her sister Blackie. They are cutie twins. Thanks, Jana, for sharing that picture of Zoe with us. She looks like she's having a good time exploring the can! She looks like a big kitty! How would our family live without you! You are such a crazy cat! Expecially when you wake us up at 5:15 am for food.